Cleaning out my draft folder and found this one. It seems ideas for blogging always happen at inconvenient times. I tried carrying various sizes of notebooks to jot down notes and blog ideas. Well, if I ever find any of my notebooks I’ll post them. Hey if you see a notebook with what appears to be Egyptian hieroglyphics send it my way, it might just be one of my notebooks. So now I keep things in my draft folder. Sometimes I actually type a rough draft, other times I at least put a link (this is one of those) and then there those that I have no idea what was bouncing through my ADHD brain at the time. It seems my greatest inspiration always come in the middle of the night or it may have been one of those …Oh squirrel moments. Well, see I’m having an ADHD moment now back to my point. Yes, I do have a point. Found prompt on Plinky a couple of months ago and it has been hanging out in my draft folder. If I could visit any city it would be either Banff, Alberta or Sydney, Australia. I know the prompt is singular city but I couldn’t decide and it is my blog. 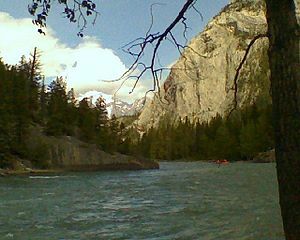 I’ve wanted to visit Banff ever since I read The Canadian West Series by Janette Oke (pronounced Oak). I have been to British Columbia a couple of times and would love to visit more of Canada. The Man from Snowy River is one of my all time favorite movies. I have wanted to visit Australia because of the movie. 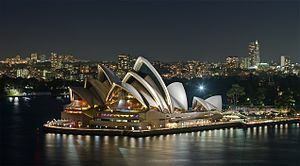 The Sydney Opera House is such an unique and beautiful building. If I’m going to travel that far might as well check out as many sites as possible. So if you could visit any city where would it be? Oh boy…there are so many I’d like to visit. I’m going to stray from the question to say if I have to narrow down my choice I want to visit Prince Edward Island. Oh that would be a great place to visit.